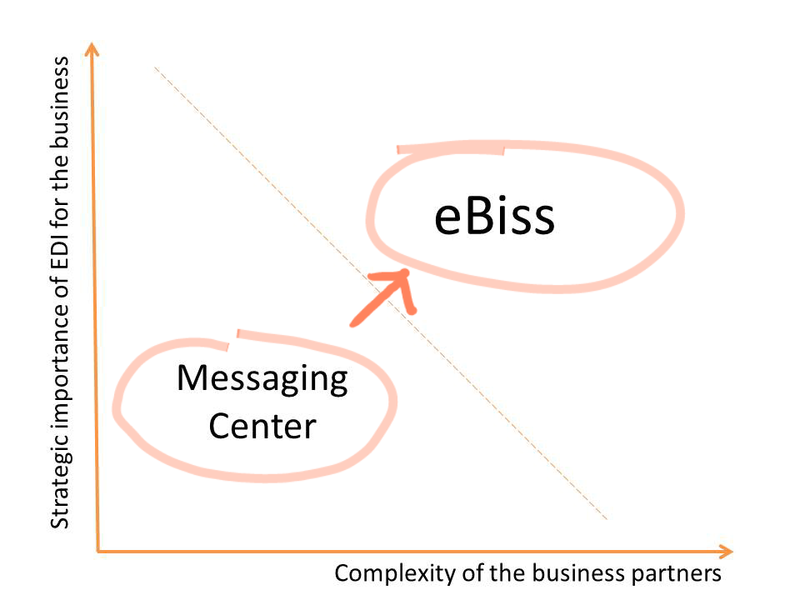 Supply chain collaboration may not function properly without EDI. EDI exists in many forms, the one better than the other. The best example of EDI in Dutch fashion retail is the retail company called Gebrs Coster, based in Capelle aan den IJssel. A not for everyone known business name, but a super-efficient retail operation with multiple mono brand formulas, but also a duo brand formula. Coster retail operates besides its unique duo brand retail formula many franchise shops of the brands: Dockers, G-Star RAW, Denim & Supply by Ralph Lauren and Adidas. The in 2011 started duo brand retail concept is called CTC ColourToColour, in which one half of the store is G-Star RAW and the other half of the store is Adidas Originals. The middle part is a common space for service (fit, checkout, combined presentations). Coster is an originally Rotterdam based family owned retail business with a rich history. Started as multi brand formula ‘Coster for father and son’ and later grown as a franchisee of Levi's and Dockers, Coster retail made a few years ago a structural turnaround towards intensive cooperation with a number of brands. Supply chain collaboration and focus on a far-reaching efficiency of operations are the key words of the success of this retail organization. The very limited amount of overhead people working at Coster and operating such a large number of shops is unprecedented in the world of fashion retail companies. To achieve this great results, Coster decided to work only with brands that strongly believe in supply chain collaboration and who can support business processes between the brand owner and retailer for 100% via EDI. For clarity Coster buys at their own risk and expense to the brands and therefore has the same processes as a traditional multi brand retailer. The seasonal collection orders are agreed upon in the showrooms of the brands. The brands deliver the order confirmations digitally via the EDI message ORDRSP per branch, accompanied by a PRICAT message including the EAN/UPC codes and suggested retail price therein. Coster doesn’t need to manually enter orders and product data anymore, resulting in huge time (and cost) savings, less errors and a much faster data and product availability. By the time the new collections are ready to dispatch to the retailer, the brand owner sends an EDI delivery note (DESADV) to the retail system of Coster, per branch stating the amount per SKU (EAN/UPC) to be delivered. The retail system of Coster (PFA from ProFashionAll) therefore knows what is going to be received. Upon delivery of the goods in the store or in the central warehouse, the goods are scanned and an automated comparison is made with the DESADV already in the system. Deviations, if any, are determined automatically and registered in PFA on detail level. Coster saves a lot of time, money and manpower. The main advantages are significantly reduced time-to-shop floor (average 4 days earlier on the shop floor) as well as to grow in the number of stores, without the capacity of the central warehouse and head office needs to be expanded. The dispatch of the goods is the trigger for the supplier to send the invoice. This process is also 100% handled digitally via EDI (INVOIC). With a twofold advantage. Coster retail doesn’t need to book invoices in its financial system (Finall of Bison software) any more. Even more important is the invoice verification, which can be done fully automated. 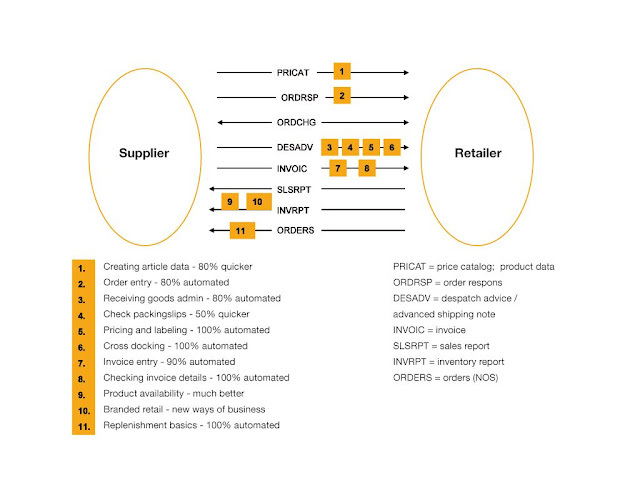 The retail management system PFA already knows what EAN codes are ordered, for which purchase price (ORDRSP) and the exact quantities received per EAN code in which branch (DESADV). The numbers actually received by barcode (scanned on entry) are stored in a database matching (FactMatch from Bizon Software). The numbers and amounts invoiced by EAN code are also written to FactMatch. Then FactMatch produces a list with the discrepancies between invoiced EAN’s and actually received EAN’s including (amount and price). Deliveries and invoices are automatically checked correct, approved and paid. This method is highly efficient and provides a tremendous decrease of workload. EDI also makes replenishment of the basics very efficient. In their stock system (PFA) COSTER entered a minimum and maximum stock level of the basics both for each branch and for each EAN code. PDF will calculate periodically which EAN code, in which amounts for which branches are needed to be reordered and will hereby create a matching EDI order (ORDERS message). At the suppliers these electronic orders will be processed automatically and with priority and therefor will be replenished within 2 days at each branch. These will be followed by DESADV and INVOIC messages and in this way the delivery, billing and control can take place very efficient! With this replenishment procedure the lower actual minimum supply as well as the lower lost sales, are very important victory points. For the handling of all their EDI traffic, Coster retail uses the dedicated EDI solution eBiss/eGate, provided, delivered and supported by FashionUniteted Indicia. Therefor Coster also exchanges EDI messages with G-star RAW, both in EDIFACT and in XML format. 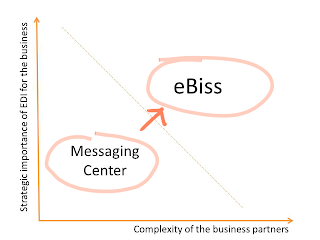 With eBiss Coster has a lot of flexibility within their own organization regarding EDI. “Without our migration from our FUI’s MessagingCentre towards eBiss/eGate our business never could have been this efficient” says Klaas Both, chief controller of Coster retail.